by VIRGIL [P. VERGILIUS MARONIS] (70-21 B.C.). Leiden:: Elzeviriana, 1636., 1636. 12mo. , 411,  pp. With elaborate engraved title-page and fold out map, index; map joint repaired, title with puncture hole mended (minor loss on recto). 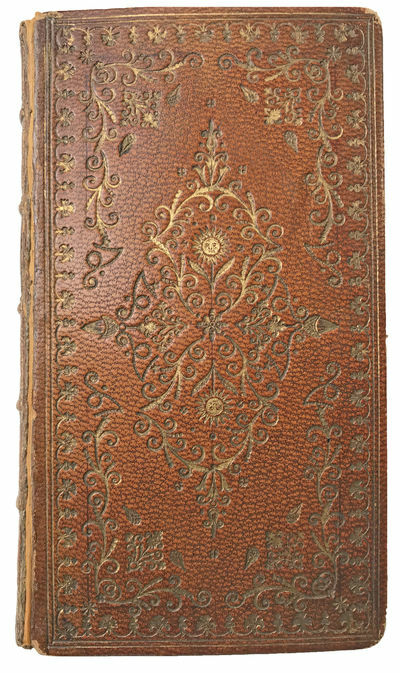 Early full light brown calf with elaborate gilt decorative covers, marbled endleaves, all edges gilt; rebacked with original spine laid down, joints starting. Title with manuscript: "Tempecata Ducant." Inscribed by J. T. Coleridge, Eton College, July 5th, 1815, "given him by E.J.[?]". Inscribed to Coleridge, "J.D. Coleridge given to him by his father, J. F. Coleridge, 65 Torrington Sq., London,. . . England." Note: John Duke Coleridge was the eldest son of Sir John Taylor Coleridge. John Duke Coleridge became Lord Chief Justice of England. SIR JOHN TAYLOR COLERIDGE'S COPY WITH HIS INSCRIPTION: Second issue of the fine 1636 Elzevier pocket edition of Virgil, Daniel Heinsius (1580-1655) and dedicated to his son Nicholaus Heinsius. Provenance: The copy of Sir John Taylor Coleridge (1790-1876), English judge and nephew of the poet Samuel Taylor Coleridge. Gustaf Schlegel Berghman, Catalogue raisonne des impressions elzeviriennes de la Bibliotheque Royale de Stockholm, 2167; Copinger #4545; Guillaume Francois De Bure, Bibliographie instructive ou Traite de la connoissance des livres . . . , Volume 7, #2684; Thomas Frognall Dibdin, Bibliomania, p. 526; Dibdin, Bibliographical Decameron, III, p.408; Schweiger III, p. 1169; Alphonse Willems, Les Elzeviers, 450. See: Wilhelm Sigmund Teuffel, Wilhelm Wagner (trans. ), A History of Roman Literature, vol. I: The Republican period, London, 1873, p. 430.